In the neighborhood where I live, no individual resident owns any land. We own only our houses. The land around them, including the flowerbeds, open areas, and woods, belong to the homeowners association. The only outside thing a resident owns is the back deck and the front steps. The lawns are mowed, the trees trimmed, and the flowerbeds maintained by a service hired by the HOA. This afternoon while I was out picking wild berries on HOA land (in a wild area bordering a stream that runs behind some houses), a neighbor stepped out to her deck and said,”Leave some for me.” I can see why she felt some ownership over the berries. The area where I was picking them was separated from her deck by just a narrow strip of mowed lawn, so they did seem to be in her backyard. Except we don’t really have yards in this neighborhood. It’s all HOA-owned land. She suggested I go pick by the tennis court. “That’s where Mary (another neighbor, not her real name) picks.” So I can pick where one neighbor picks but not where this one does? I did offer to continue my day’s berry picking at another patch I had discovered a little further upstream. “Yes, you go pick there,” she enthusiastically agreed. I also offered to not come picking in “her” patch everyday, as I had been. Her “Whatever” reply implied that I was not supposed to pick there at all, ever. I continued upstream to pick in the other patch. Is this “my” patch now, I wondered. Can I kick out anyone else who tries to pick here? Or is this the place where the neighbor will send the next person who comes picking in “her” patch, as she tried to send me to pick in “Mary’s” patch? I suppose if there were a berry patch right outside my backdoor, I would not be happy to see other neighbors picking there. But I don’t think I would dare tell them to go away. I certainly couldn’t order them off my land, since it isn’t even mine. This entry was posted in fruits, wild foods and tagged berries. Bookmark the permalink. 3 Responses to Who owns the berries? I wondered the same thing as I stopped on the road last to pick from a road side bush. I know the town has the legal right of way but does the land owner behind mind I pick. 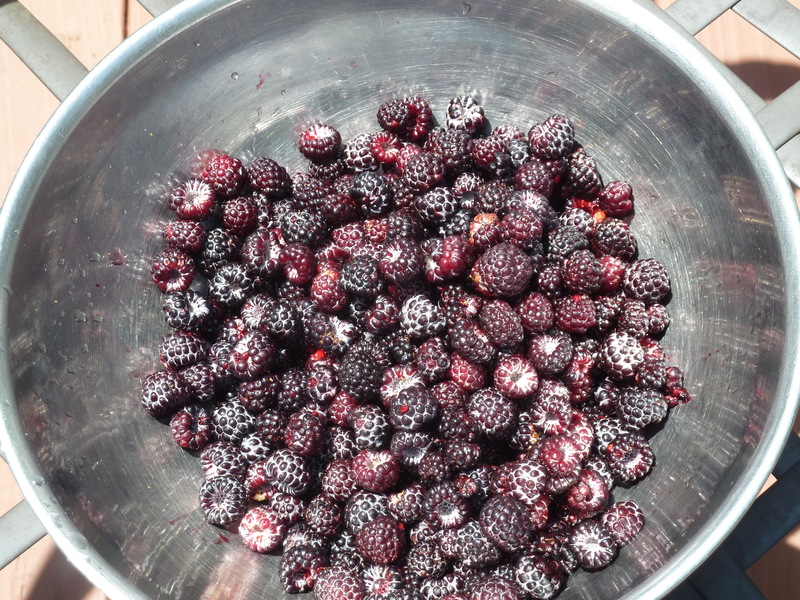 It was a beautiful bunch of black raspberry’s I couldn’t resist. I know what you mean. And chances are, if you don’t pick those berries, nobody else will, either. But you never know when you have stumbled upon someone else’s favorite picking spot.